Washington, D.C.-(ENEWSF)- A new model shows how an elusive type of black hole can be formed in the gas surrounding their supermassive counterparts. In research published in the Monthly Notices of the Royal Astronomical Society, scientists from the American Museum of Natural History, the City University of New York, the Jet Propulsion Laboratory of the California Institute of Technology, and the Harvard-Smithsonian Center for Astrophysics propose that intermediate-mass black holes-light-swallowing celestial objects with masses ranging from hundreds to many thousands of times the mass of the Sun-can grow in the gas disks around supermassive black holes in the centers of galaxies. The physical mechanism parallels the model astrophysicists use to describe the growth of giant planets in the gas disks surrounding stars. "We know about small black holes, which tend to be close to us and have masses a few to 10 times that of our Sun, and we know about supermassive black holes, which are found in the centers of galaxies and have a mass that’s millions to billions of times the mass of the sun," said coauthor Saavik Ford, who is a research associate in the Museum’s Department of Astrophysics as well as a professor at the Borough of Manhattan Community College, City University of New York (CUNY) and a faculty member at CUNY’s Graduate Center. "But we have no evidence for the middle stage. Intermediate-mass black holes are much harder to find." The birth of an intermediate black hole starts with the death of a star that forms a stellar or low-mass black hole. In order for this "seed" to grow, it must collide with and consume other dead and living stars. But even though there are many billions of stars in large galaxies, there’s an even greater proportion of empty space, making collisions a very rare occurrence. The researchers’ new model suggests that previous searches for middleweight black holes might have been focused on the wrong birthing ground. "The recent focus had been on star clusters, but objects there move very quickly and there’s no gas, which makes the chances of a collision very slim," said Barry McKernan, a research associate in the Museum’s Department of Astrophysics who is a professor at CUNY’s Borough of Manhattan Community College and a faculty member at CUNY’s Graduate Center. The new mechanism turns attention instead to active galactic nuclei, the piping hot and ultra-bright cores of galaxies that feed supermassive black holes. The gas in this system is key, causing the stars to slow down and conform to a circularized orbit. "You can think of the stars as cars traveling on a 10-lane highway," McKernan said. "If there were no gas, the cars would be going at very different speeds and mostly staying in their lanes, making the odds of collision low. When you add gas, it slows the cars to matching speeds but also moves them into other lanes, making the odds of collision and consumption much higher." The resulting collisions allow a stellar black hole to swallow stars and grow. The black hole’s size and gravitational pull increase as its mass expands, escalating its chance of further collisions. This phenomenon, called "runaway growth," can lead to the creation of an intermediate-mass black hole. As they increase in size, the black holes start altering the gas disk that controls them. 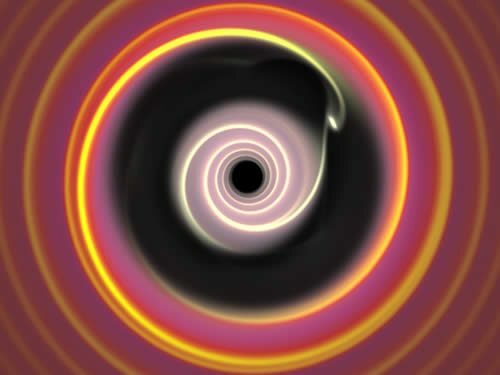 The researchers’ model shows that black holes of a certain mass can create a gap in the gas disk, a signature that might give scientists the first glimpse of intermediate black holes. The model describing this growth is a scaled-up version of the mechanism for the formation of gas giant planets like Jupiter and Saturn. Like intermediate black holes, these planets are thought to have grown in gas disks. The planets, though, developed in disks surrounding newly forming stars. Mordecai-Mark Mac Low, chair of the Department of Astrophysics at the Museum, has modeled that case. "In some regions, we showed that rocky planets could be moved by the gas into common orbits, where they collide to form objects more than ten times the mass of the Earth, massive enough to attract gas and form gas giant planets," Mac Low said. "The creative work described here applies the same principles to the far more massive disks found at the centers of galaxies, to form black holes rather than giant planets." Other authors on the paper include Museum research associate Wladimir Lyra from the Jet Propulsion Laboratory at the California Institute of Technology and Hagai Perets from the Harvard-Smithsonian Center for Astrophysics. This work was supported in part by NASA and CUNY. Research paper: B. McKernan, K.E.S. Ford, W. Lyra, H.B. Perets, "Intermediate mass black holes in AGN disks – I. Production & Growth," Mon. Not. R. Astron. Soc. (2012).